I’m a software developer and I’m not disappointed by new Apple Macbook. Why? Because I didn’t wait for it and got a different laptop instead! Ok, I admit the title is a bit cheesy:) But that’s it really. In June I was shopping for a new laptop and considered available options. At the time Apple was silent about specs and release date of the new MBP as usual. BTW: I’m using Macbook PRO 2015 at work everyday and it’s ok, but I needed more powerful machine for personal use. The previous setup I had included two laptops: one used for the development, the other one was used as a server. It needed upgrade as I was planning to travel Asia this winter. Which didn’t happen because I moved to Berlin, Germany instead in October. at least 32GB RAM - that was mandatory, 64GB would be even better. I’m not going to change laptop every year, so it should be somewhat future-proof. i7-6700 CPU or better. My previous laptop had i7-2630qm which was still working fine but was really hot and power-hungry. I needed something at least on par with that CPU. 14”-15” screen, unfortunately 13” screens don’t work for me. it should not get hot. As I said 2630qm was getting hot all the time and working in Thailand climate turned out to be really difficult when I was there. the previous point rules out most powerful graphics cards. That’s ok as I don’t play videogames nor do 3d graphics-related stuff. it should be light. Previous laptop was 17” and it was really heavy. Not convenient for travelling. There were several good options on the market, Asus Zenbook Pro UX501VW, DELL XPS, some MSI offers, Asus ROG, Sager/Clevo had nice offers, etc. New Macbook Pro was not available and the old one didn’t satisfy my needs. At first I was planning to buy a Dell XPS 15 despite some people reporting issues with it. My spouse has one already and it’s really nice machine. 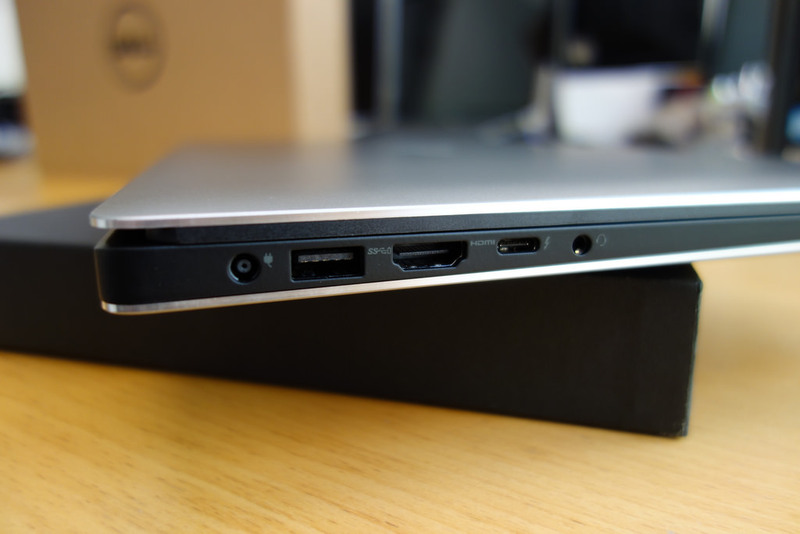 But luckily I stumbled upon another Dell laptop - Dell Precision 15 5000 Series (5510). It had all the features I wanted and then some. 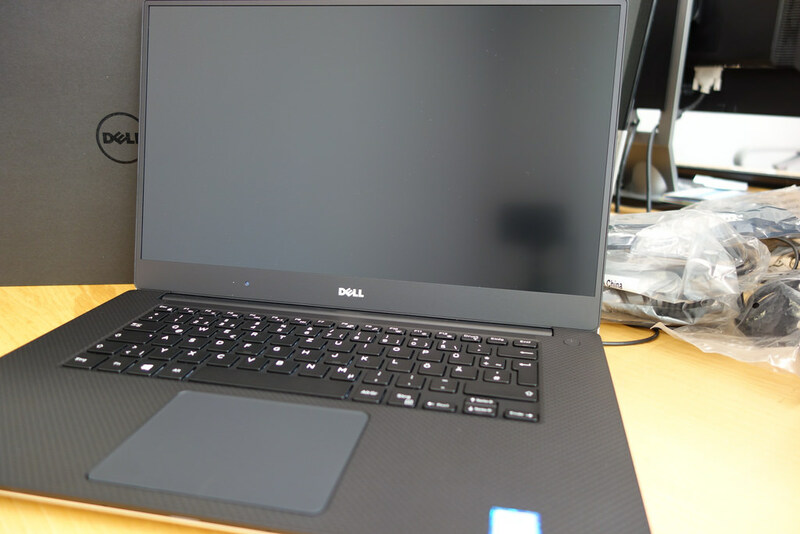 It looks exactly like Dell XPS, but has more powerful processor and less powerful graphics card. As far as I understand everything else is pretty much the same. So I got it and don’t regret. The particular model I got has i7-6820HQ, 32GB DDR4 RAM, 512GB SSD, Nvidia Quadro M1000M/Intel HD Graphics 530, Windows 10 PRO. I can’t say enough good things about this machine. It’s powerful, fast and light. Works really well for me. Cons? Windows 10 seems to be restarting computer whenever it wants and there’s no way to completely prevent it. Unfortunately for me it’s not possible to comfortably develop on Windows alone. I need virtual machine with Linux to be able to work with the latest technologies. It’s just a lot easier on Linux. 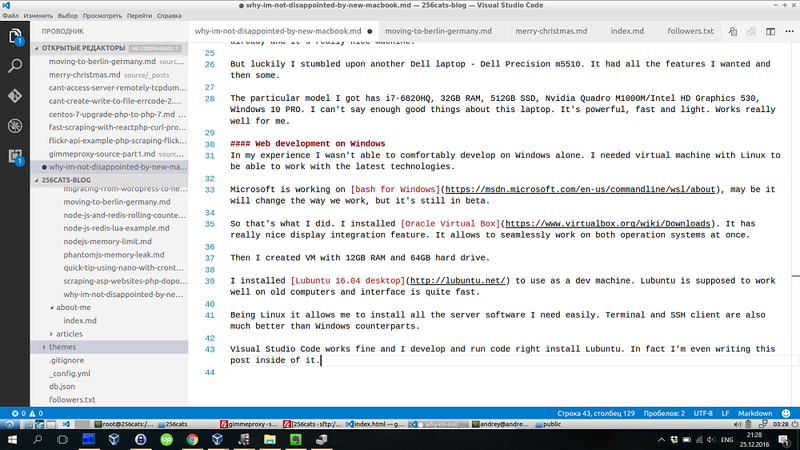 Microsoft is working on bash for Windows, maybe it will change the way I work, but now it’s still experimental. So that’s what I did. I installed Oracle Virtual Box. It has great display integration feature allowing to seamlessly work on both operation systems at once. Then I created VM with 12GB RAM and 64GB hard drive. I installed Lubuntu 16.04 desktop to use as a dev machine. Lubuntu is supposed to work well on old computers and interface is quite fast. It’s really fast in VM. Being Linux Lubuntu allows me to install all the server software I need easily. Terminal and SSH client are also much better than Windows counterparts. Visual Studio Code works fine and I develop and run code right inside Lubuntu. In fact I’m even writing this post inside of it. This setup works well for me for several months already. Hopefully this info will help someone in the same position as I was.